Once my baby began toddling; protecting him was my main priority. While I didn’t go over the top and place bumper pads on all of the corners of my furniture; I did invest in some great baby monitors, outlet covers, and baby gates. One of the gates that I purchased was the Summer Infant Banister and Stair gate. With any product, there are some pros and cons of using it. Let me outline them for you if you are in the market to purchase a baby gate or two for yourself or a friend. The Summer Infant Banister and Stair gate sold at most baby stores and major retailers like Home Depot, Target, and Lowes as well as Amazon. It is designed for children ages 6 to 24 months. The gate is sold in a dual installation kit and its goal is to give parents peace of mind as their children are just learning to walk or crawl. 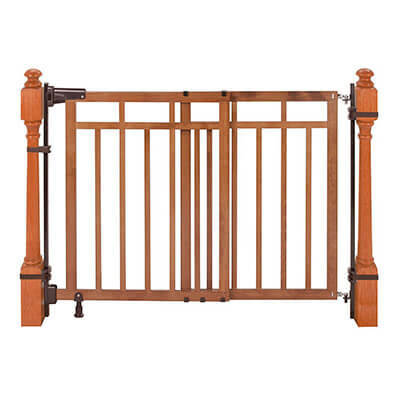 The gate boasts banister to banister installation and can be used at the top or bottom of stairs. It can also be used in doorways and other openings that are 32”-48” wide, and it stands 33” tall. It’s versatile. If you only choose to purchase one gate, you can move it where ever you need it the most on a day to day basis. It does not require any drilling into your permanent banisters. It has attachment pieces that are easy to assemble and that come with simple directions. It has a quick release mechanism that allows for easy movement. It has a neutral wood finish so it blends in with your wooden banisters, stairs, or hardwood floors. It can double as a pet gate when your child outgrows it. It’s not very sturdy on wide openings. Once the gate is extended, the weight is heavy for the hinges and it restricts that gate from opening freely back and forth. It’s on the expensive side. Most baby gates range between $25-$50. At almost $90 per gate; purchasing more than one can really add up. So, what’s my verdict? I have narrow stairwells, so the gate worked perfectly. It was extremely secure and sturdy. But, just to try it as an experiment; I moved the gate to a wider opening in one of my rooms. After a little force, I did find that it was less sturdy and more difficult to open, especially with one hand. I do think it is also a little on the pricey side, but I believe that you get what you pay for. I do like the fact that you can put it on your baby registry or use major retailer coupons or reward dollars to apply toward its cost. So, you may not have to pay full price for it. If you are purchasing it used from a consignment shop or from a site like Ebay be sure it has all of the parts for the installation process. Overall, it is a high quality, safe item but I believe it is best used in narrow openings for maximum safety.